The wind felt like a bristle brush as it passed by me. It was a normal morning in Neopia, except, of course, the fact that it was cold, windy, and I couldn't feel my toes. I didn't know much about Neopia, I mostly just knew that on days like this, you should be able to travel to a warmer place, or somewhere comfortable. But I didn't have any wings, so I couldn't fly to somewhere nice like the lost desert, and I had no owner, so I couldn't go inside a warm NeoHome, either. I was a bit disappointed, but even so, I tried to run around to make myself warm. Nope. Didn't work. Now I was cold, and worn out. 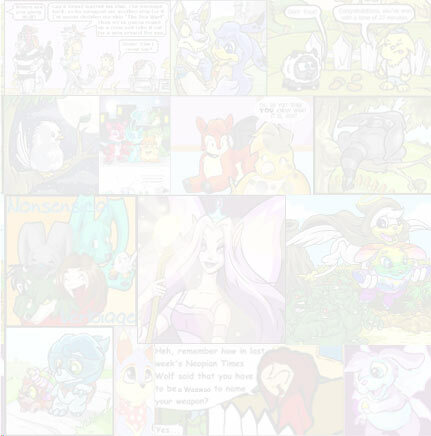 I was sleeping by a park last night, and when I awoke, I saw Neopets playing with their owners. I had the urge to join, but I didn't. The park was medium sized. There were 4 swings-two regular swings and 2 baby swings. On the other side of the playground was a jungle gym. It had to have had 2 fire poles and 4 slides. 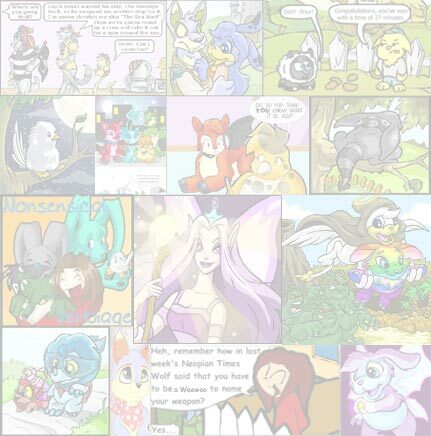 There were a lot of baby Neopets playing tag around it, along with a few owners sitting on a bench reading books. I wanted to play with them, I could use a game of tag now and then, but they were probably a big group of friends, and didn't like outsiders. You never knew. So instead of playing with all of the Neopets at the park, I turned around to see a forest. The trees were tall, they looked like they towered to the heavens, and at the top, you could see the sun shining down on your face through the green leaves. I walked along through the forest, staring at the trees merrily. I was kicking a rock, and I glanced down to see that there was something shiny in the grass. I jogged over to it to see what it was. It was something I had not seen before, it looked like a coin, but it couldn't be… I knew it wasn't a Neopoint, I had seen owners drop some before. I picked it up and kept it as I walked along. I walked a little more, still pondering about the coin. I stopped and rested, as my little Krawk feet were getting painful and needed to rest. I sat down under a tree and looked at the coin. Why would there be a silver coin just laying on the ground? I thought. I knew there had to be some kind of explanation, I just couldn't figure it out. The thoughts, What is this coin? Where did it come from? Kept flooding into my mind. It bugged me that I could not figure it out. The only thing it had on it was a picture of a moon staff. I wondered why anyone would engrave a picture of a staff on a blank coin, but then again, maybe there was a certain purpose, maybe there was a secret behind it. I then heard something flying above me, I looked up and I saw a purple Shoyru flying to the apple tree near me. The Shoyru picked an apple and noticed me. She flew towards me and landed next to my feet. "Hey! You're a Krawk petpet! I never see any of you around anymore!" she said to me. "Yeah, well… we don't travel much outside Krawk island," I replied. "My name is Bee. What's yours?" Bee told me. "Erm… I don't really have a name…" I answered to her. "You're a Krawk petpet that doesn't have a name and lives out of Krawk island. You have a very odd case, you know," Bee exclaimed. "I know… but I don't really mind it. It's not like I desire a name or anything. I don't need one, after all. Although, sometimes I do wonder why I am in Neopia Central and not Krawk island, I don't really remember my past. I know I'm not suppose to be here, because I can't find anyone like me." I said, looking away into the forest. "Say-do you know anything about coins?" "Well, I found this coin, and it's not a Neopoint. It has a picture of moon staff on it, and I cant really figure out what it is," I said. "Hmm… let me see it," I handed it over to her, and she looked it over carefully. "Looks like it may be an ancient dubloon coin, but the only place I know to get moon staffs are in the magic shop, but they are made in the mountains beyond this forest…I wonder why they would make such a dubloon, but then again, they don't use it anymore, so that may be a clue," Bee said. "Where did you find it?" "I found it on the ground when I entered the forest. I was kicking rocks and noticed something shiny…." I replied. "Hey! Maybe we can dig up its past! See what it is?" Bee said excitingly. "Ummm… why? It's just a coin…" I said. "Yes, but, now that I think about it, it doesn't look like a dubloon at all! I don't even think it's a coin, I think it's a magical tool the faeries must have used in ancient Neopia…" Bee told me. "Then why would it be lying on the ground under a rock?" I asked. "Good question. Maybe we will find out!" she sounded so excited. "Well, now that I know you, you need to have a name," Bee said thoughtfully. "How about the name… AdventureSeeker? Or Wild_dragon?" "I don't know… I've always liked the name Dragonslake," I said. "Dragonslake. That name sounds OK. I like it. I will call you Dragonslake from now on, OK?" Bee declared. "Sure, doesn't bother me," I said. "Let's get going to find out the mysteries of the coin!" Bee stood up, and took a few steps into the woods. "Come along! You mustn't be able to get very far sitting like that, wingless!" she started to fly, but as soon as she did, she disappeared into thin air, as if she were a hologram, and shorted out, but the problem was she wasn't a hologram. "BEE!!!! Where are you?!" I yelped in fear. "BEEE!!!!" I suddenly heard a soft voice, singing in the air. I couldn't trace to where it was, though. It seemed as if it was in my head, but I knew it wasn't. Where is that coming from? I asked myself. It has to be a Faerie… only they can sing so softly and aimlessly. I couldn't pinpoint the song, either. I had heard it somewhere else, but I couldn't tell where. I wanted to race towards the Faerie and ask them where they got the song. But I couldn't trace it down, and I had to look for Bee. I looked down at the coin, and it was glowing. It had to be a Faerie instrument. I was positive that the music was triggering it to glow. I saw the glowing changed colors. It was mostly white, but I could see it had another layer of the rainbow beyond the whiteness. I wondered if the faeries had ever studied the aurora borealis, because that is what it looked like. And then the music, all of a sudden, just stopped, and the coin stopped glowing. As I got up, I picked up the coin. I really wish I had a belt or pockets, because then I wouldn't have to carry it in my claws, it was annoyingly heavy. It was no use thinking of how annoying the artifact was, so I forgot about it and walked over by the spot Bee disappeared at. That's where Bee went missing, I thought. I have to step there to find her. I was scared to step, but I knew that I had to, so I closed my eyes and stepped forward. I reopened my eyes to find myself in a cold cave. It looked like Dank Cave, the cave in NeoQuest, only it was not as confusing as Dank Cave. The cave wasn't one of those caves where there was a big open area to sleep on. It was more like a tunnel than a cave. There was a small inch-wide stream flowing across the bottom of the cave. The air around me was still, but it was just as chilly as when I closed my eyes. There were a few stones along the bottom of the walls, but not that many. Everything was made of rock, the walls, ceiling, and floor. You couldn't tell where the walls stopped, or where the ceiling began, because it was rounded off and looked like one big wall, covering you. The stream was flowing the opposite direction I was facing. I decided not to turn around, but to walk the opposite way of the water. It was quite boring,, as I was walking along. Nothing was happening. Then, I saw something swimming in the stream. How could there be something SWIMMING? It can be more than a centimeter deep! If even that! I thought to myself. The swimmer seemed to be following me. It was going the direction I was. I tried to outrun it, I didn't want to get caught up into a fight with a jetsam or something. Faster and faster I went, trying to outrun the shadow in the water. I noticed I was getting more and more away from it as I ran. I could see it was trying to catch up with me. I turned back around to look where I was going. "Stop!!" said a voice behind me. I froze with fear and turned around. It was a water Faerie to my relief. "Do you want me to help you or not?" the Faerie asked. "I… uhhh…" I was speechless. She had caught me off-guard. "Um… yeah… yes, I would like you to help me." "Then stop running away from me!" she exclaimed madly. She then went underwater and swam towards me. "My name is Vanilla," she told me. "If you want to see your friend, follow me." She then dove underwater once more. I sighed. This is crazy, I thought, but even so, I closed my eyes and dove into the inch wide stream after her. I waited to her the sound of my head hitting the hard floor, but it never happened. I opened my eyes, and I saw that I was in a cave, just like the other one, but underwater. I tried to hold my breath for as long as I can, but I couldn't stand it any longer. I must've been turning colors because Vanilla said, "breathe!!!" I stopped trying to hold my breath, and I found out that, unlike most waters, I could breathe. I could breathe pure air! I saw that I could talk as well. "What kind of place is this?" I asked Vanilla. "It's a pathway for water Faeries. It was designed by us, for us. We used are magic so we could allow visitors as well. So you do not have to hold your breath like that," she told me. That made me feel incredibly stupid, but I didn't say anything. "Follow me down this pathway," said Vanilla. I haven't swum much, so I had to get the hang of it. I was glad that I couldn't drown, or I probably would have by now. Once I did get the hang of it, though, I caught up to Vanilla. "You've been watched since you picked up that coin," said Vanilla. "You've been watched, Dragonslake. See, that coin you have is what we call a moonstone. It is our key to the moon that is why there's a moon staff on it. We sent an earth Faerie to take it up to the mountains the other day, but unfortunately she was rather clumsy and dropped it in the woods. We put it in a mode so if someone picks it up, within 24 hours, they would be sent to us. Unfortunately, a dark Faerie named Anun saw this power, and abused it. Thankfully she did not get a hold of the moonstone, although, she got a hold of your friend instead. We must stop her before she does something drastic. I fear we do not have that much time," Vanilla informed. After much time swimming, we came to a shut circle door. It had designs all over it, and in the middle, there was the engraved picture of a moon staff. "Let me see the moon stone, Dragonslake," Vanilla asked. Of course, I handed it to her. She placed the side with the picture of a moon staff towards the picture on the wall. When they touched, a bright light came from between the two surfaces, and the circle door slid into the rock. There was a wide room behind the doorway. It was much bigger than the caves I was in earlier. It looked like quite a nice sitting room from out of a NeoHome, it was nicely furnished with dark blue furniture, and there were magic books on a shelf. There was a dark Faerie sitting in a dark blue chair, reading the book "How to Perform Advanced Dark Magic" in the middle back of the room. She looked up from her book and noticed us. I figured she was Anun. "So, have you come for your precious friend or to give me the moonstone?" she spat bitterly. I gasped when I looked to the right. There was Bee, lying on the ground. I rushed over to her and sat down beside her. "Don't worry, she's just out cold," Anun said venomously. "How could you do this?" I asked her. "I warned her I would put a spell on her, she would not tell where the stone was or who was keeping it," she informed. "She had her chance, I am just disappointed because I didn't get rid of her permanently." "You're a monster!" I cried. "You only care about yourself!" Vanilla then began to sing softly. It was the song from earlier. I wondered if she was the one that sang it earlier, too. I opened my hand. The moonstone was glowing like mad, and the colors were much more vivid this time. It shot a ray of light, covering the whole room. I could not see anything but the bright light of the coin. I could hear Anun gasp in fear and yelp, and then, it was over. The light had gone away, Anun seemed to have gone, and Bee awoke. "What's going on here?" said Bee, drowsily. "What happened?" "You were under a sleeping spell," replied Vanilla. Vanilla transported us to where we were in the forest earlier. She brought Fyora, and Fyora took the moon stone and thanked us both for taking such good care of it. "Here, this is for you guys. I hope you like it," Vanilla said. She said some kind of Faerie language I didn't understand and put her hands together like a bowl. A necklace was soon placed in her hands. It had a blue gem on it, and fang-looking beads surrounded the gem. It was a Water Faerie necklace. "You can decide who wears it… I surely don't need it." The Faeries then disappeared. "I have no clue," I replied.